Lark Mason Associates' sale of Japanese Woodblock Prints features prints from Yoshitoshi and other prominent woodblock print artists of the 19th and 20th century. Woodblock prints are excellent items for young art enthusiasts looking to start or grow their collections of Asian Works of Art. 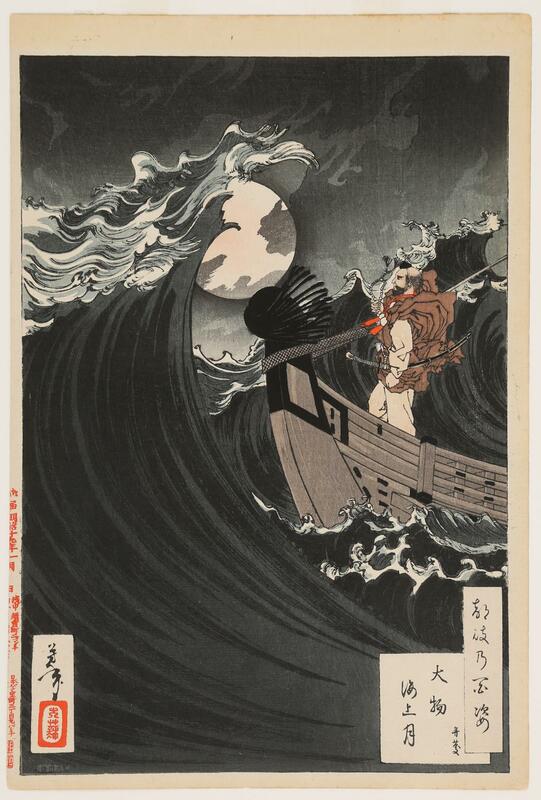 The popularity of woodblock prints at the time of publication means that these prints, while not abundant, are accessible in terms of price point as well as their content. Japan faced great change during Yoshitoshi's life, which he depicted by featuring traditional subject matter through a traditional art form that was its own form of protest in a time of political upheaval. For example, his work "The Village of the Shi Clan on a Moonlit Night" features Shi Jin, a heavily tattooed character from the Shui hu zhuan, a thirteenth century Chinese novel that gained popularity in Japan at the time of its translation in the early 1800s. Shi Jin, as part of a group of outlaws, terrorized wicked landowners and corrupt officials, and they "gained a reputation for high-principled, chivalrous deeds, which became the material of literature." (Stevenson, p. 72) This particular image depicts Shi Jin before he joins the bandits, as he learns of an attack the bandits are planning on his village. He subsequently captures and releases the bandits upon learning of the oppression and injustice that forced them to banditry. Though he hasn't yet met the bandits and experienced his change of heart, the heavy tattoos that flow across his body are marks of outlaws; even in modern Japan, tattoos mark yakuza gangsters, laborers, and prostitutes. This is the juxtaposition between the law-abiding subject and the outlaw, the collision of aristocracy and nobility suggested by the nine dragons, and the implication of the presence of the tattoo, that of a low-class laborer.